It has been a wonderful few weeks here at Grace with our lovely new teacher, Ms Kelly O’Dea, settling in well. With our teaching team being small and very close, it has been essential that we have teachers that can inspire each other. Who also understand God’s love for our children and teachers that will pray for our families and each other. There will be aKindy Fish and Chip night held during term 2 to meet and celebrate Kelly (Ms O’Dea), also Andrea (Mrs Boult) and Meg (Mrs Humphries) who have taken on extra teaching hours. The date has yet to be arranged. We have continued with our programme of showing atawhai (kindness) love and respect with both of the sessions. The children have been so thoughtful with their ideas of how to be kind and ways of sharing God’s love. Next week we will be having discussions and acting out stories with both of the sessions which look at Jesus’ life in order to celebrate Easter and Jesus’ resurrection. The Younger Tamariki Session children have decorated frames and the Older Tamariki Session have made and painted wooden crosses to take home as a special Easter gift. A focus on science experiments has been very popular with the older session, as was the recent trip to the Nairnville Park Recreation Centre where they attended their ‘Gymnastix’ class. Such fun was had by the children, the teachers and parent helpers on the large bouncy slide, the large trampoline plus lots of other challenging activities. A big Grace welcome to the Zhang family, the Smith family, the Schwarzhaupt family, the Robinson family, the Pohvilainen family, the Poh family, the Munn family, the McGee family, the Macdonald family, and the Eves family. Thank you to the parents who have signed up forParent Helpfor term 2. Parent help is a great opportunity to connect with your child and their friends whilst providing much appreciated help for the session. Please make sure there are no chocolates, lollies or products containing nuts in your child’s lunch. This includes no peanut butter sandwiches and muesli bars containing nuts. For the Younger Session please do not bring in any whole eggs (such as egg sandwiches). The weather is starting to turn cold and very changeable, so please remember to pack and label a warm jacket for their outside play. in our younger session. 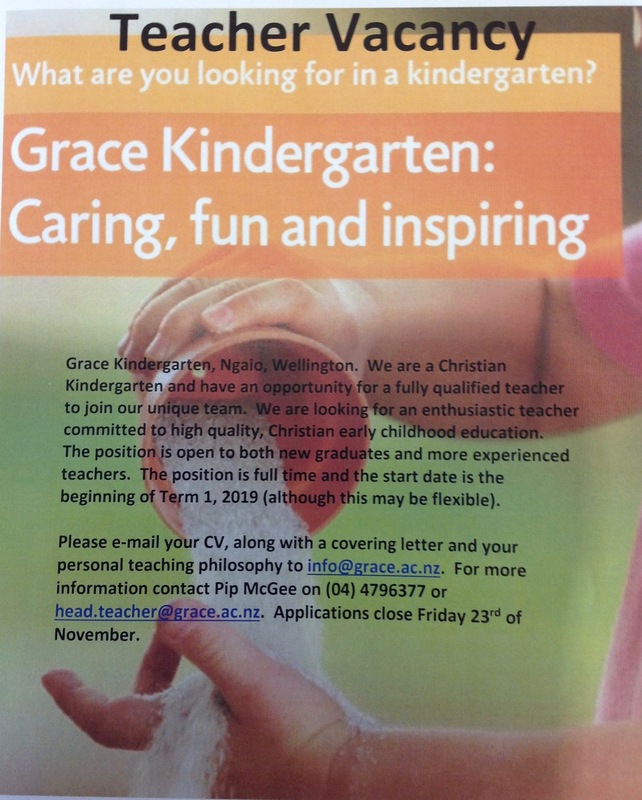 Please grab some flyers, from our sign-in table, if you know of friends and family who might be interested in joining the Grace Kindy family. It’s such a lovely time of the year being able to discuss with the children the real meaning of Christmas. The children are having such an exciting time making props and decorations for our upcoming Christmas show, close friends and relatives are also very welcome to join us in celebrating our Christian culture. TheKindy Christmas Show will be held here this Friday 7thDecember. At 5.30 the church hall opens, 5.45pm the children will be asked to come out the back with the teachers and the show will begin at 6pm. The show will be followed by a shared supper. For the safety of our children we ask you to make sure that NO cars are parked on our driveway. In order to help teach the Older Children manaakitanga (hospitality), we have invited some of the residents from Churton Leigh Rest-home to come for morning tea and to see the children sing some Christmas songs on Tuesday 18thDecember. The children will be handing out morning tea and the bookmark gifts they have made for our special guests. We would also like to extend the above invitation to Grandparents and special friends of our children. ‘Little Dogs Barking’ puppet show will be coming to Grace Kindy on Tues 11thDecember at 1pm. Both sessions are invited to come to see ‘Twinkle’ – the cost is $5. Please note that any children who wish to attend from the younger session will need to be accompanied by a parent or caregiver. With both of our sessions we are having some very insightful discussions, songs and stories about the birth of Jesus. With our Older Tamariki we are ‘encouraging the children to understand that they are uniquely gifted by God’ (from our Special Character Curriculum). We are doing this by encouraging the Older Tamariki to become reporters of their culture. They have been busy bringing in resources such as photos, video’s, instruments etc that relate to special family traditions and their own unique culture. The Older Tamariki have even become so confident with speaking that they have embraced using te reo forintroducing themselves. A big Grace welcome to theHeinrich-Agius family, the Morris family, the Willard family, the Young family and the Smith-Cakebread family. Thank you to the parents who have signed up for Parent Helpfor term 4. Parent help is a great opportunity to connect with your child and their friends whilst providing much appreciated help for the session. Andrea Boult visited another centre for her Professional Development and has gained an insight in how other centres work. Pip McGee attended a course on ‘Communicating with empathy’ which looked at ways of recognising children’s needs on an emotional level. The weather is starting to turn quite hot, with some very sunny patches, so please remember to pack and label your child’s sunhat. The teachers and the children have already had a very busy start to term 2. The children have been so excited to be making a special card for their mothers and we have been busy discussing with the children lots of the special things God has created, including their Mothers. With this week being sign language week we have been reiterating some of the signs we use during our session, particularly when saying our Grace at morning tea time. The Older Tamariki Session have been running its own version of the ‘Grace Kindy Commonwealth Games’ and have learnt lots of new skills such as javelin throwing, long jump, gym/beam work, rowing and weight- lifting. The Older Tamariki session will finish off with a special medal ceremony held on Thursday at 2.45pm, complete with the National Anthem and a podium set up (Any parent is most welcome to join in). For both sessions, we are having a focus on retelling and acting out bible stories. The children this week very much enjoyed the teachers acting out ‘Jesus calms the storm’. We will be encouraging all the children to join in and have a go at acting also. THANK YOU to Blair who has fixed a variety of equipment this week. We require each family of the Younger Tamariki Session to put their name down to two parent helps each. A big Grace welcome to theCross family, the Humphries family, the Millar family, the Ung family and the Bosman family. As a teaching team we will be attending a talk on the importance of ‘Raising Resilient Kids’ and ways of helping children manage stress better. This talk is also open for parents to attend so please see the notice board or one of the teachers if interested. The weather is getting very chilly at the moment, so please do remember to now pack a sweatshirt or something warm for your child as outside is open all year round, if there is no rain. Welcome back to kindy for 2018. It is so lovely to see the children so happy, settled and engaged despite the very hot weather. Mrs Wee (Pansy) is in Singapore for three weeks, to celebrate with family a very special birthday. She will be back with us on Monday 26th February. We look forward to her skyping the children at kindy and sharing some of the Chinese New Year celebrations with us. During this time Esther van der Voorn will be relieving as well as Sally Rowe. These qualified teachers are familiar with the children and our centre so we are excited to welcome them back. Please pop into your diary Friday 23rd of February for a midday parent get together and BYO lunch in the OCC hall, starting from 12:00pm. Thank you to Laurel (Ezekiel’s mum) who is kindly organising this opportunity for parents to get to know each other. We have quite a few vacancies for Parent Help so please sign up urgently if you have not done so already. Is there a handy parent who would help us by fixing a little wooden dolls high chair. A big Grace welcome to the Sheldon family and the Yeoman family. Also another child from the Dycus and the Monk family. For both sessions we have been looking at some of the ‘fruits of the spirit’ and sharing examples of these with each other. Literacy and maths concepts have then been added to extend this topic. We have enjoyed hearing the Older Tamariki’s prayers in response to showing kindness to their family and friends. Next week we will be focusing on the Maori culture as Tuesday is Waitangi Day. The children will have the opportunity to participate in activities such as, flax weaving, using rakau sticks to a variety of waiata, and cultural stories. If you have some ideas for Maori based activities or have a contact who is involved in kapa haka etc (this could be your own older child) we would love to hear from you about ways we can provide our children with Maori cultural experiences. Health and Safety: The intersection of Ngatoto Street and Khandallah Road is very dangerous when making a right turn to drive north. Due to the road alignment and speed of vehicles travelling along this stretch of road, we regularly see near misses of vehicles pulling onto Khandallah Road. We ask all our families wanting to head north please continue down Ngatoto Street, onto Swansea Street and back around to the intersection of Lucknow Terrace and Khandallah Road. This is a much safer intersection to rejoin back onto Khandallah Road and is only one or two minutes slower. A reminder to please put your name on our parent help roster. This is a great opportunity to connect with your child and their friends whilst providing much appreciated help for the session. Also for the families of the Older Tamariki Session to put their names down for three parent helps each. This continues to be a very changeable time of the year, so please remember to make sure that your child has access to both a sweatshirt and a sun hat. For all outdoor play the children must be wearing a sunhat. We encourage you to place sunscreen on your child before their arrival to kindy, however we have a bottle of sunscreen beside the sign-in sheet for use on your arrival. The teachers will be putting sunscreen onto your child around 1pm. Please advise the teachers if you prefer to provide us with your own child’s sunscreen.